Port Orchard home takes on Asian aesthetics after couple spends 19 years in Japan. Imagine building a new home, then moving overseas for nearly two decades, and returning to that home that had quietly aged. That’s what one Port Orchard couple did — and when they returned, they knew the old home needed some updates and changes to meet the aesthetics of modern design and both their refined tastes after living in Japan for 19 years. The two-story, three-bedroom, two-and-a-half-bath home, built on 3 acres near a golf course (the husband is an avid golfer), was constructed in 1992. It was a starter home for the couple — and also their first time building a home. Working within a tight budget — they were in their 20s when they built the home — they purchased blueprints and made some modifications to the plans. 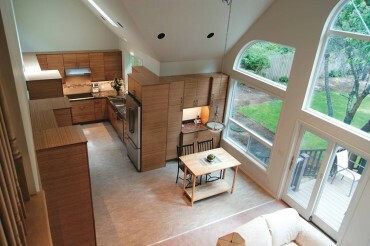 To create more storage space, they eliminated a bonus room over the garage and changed the sizing of some rooms. The wife lived in the home the first four years while her husband “lived in a suitcase” working as a civilian for the U.S. Navy. 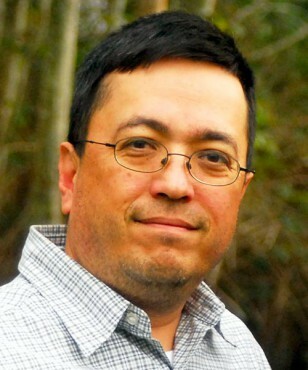 He was then assigned a job in Japan, so they moved there while a property management company handled the rental of their home for them. 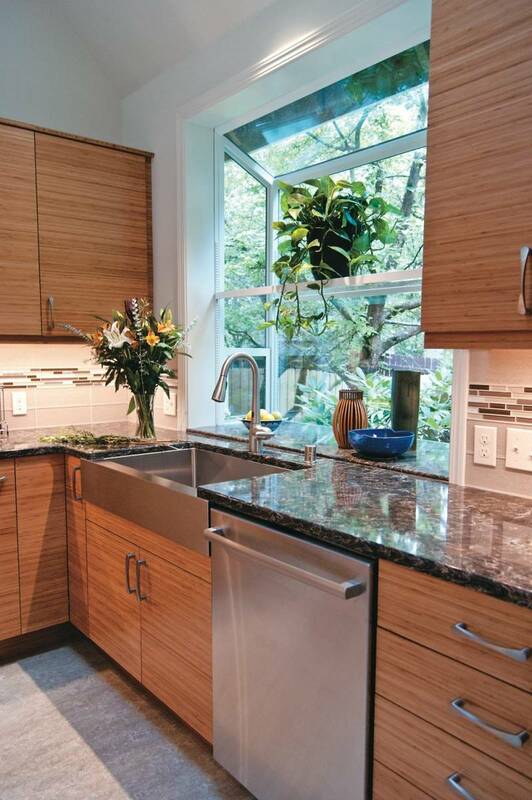 Before returning, the couple began researching home designers who could help them modernize their home and they came across a listing for Molly McCabe — co-owner with her husband, Clive Pardy, of A Kitchen That Works, based on Bainbridge Island since 2010. Her husband had accumulated a fair amount of paid leave so the couple took advantage of that and traveled back to the United States to meet with McCabe and talk about their plans for the house. The work began while the two were still in Japan. Working with a couple who was living in a time zone 17 hours ahead did present some challenges for McCabe, but overall “the house itself didn’t have many challenges,” she said. 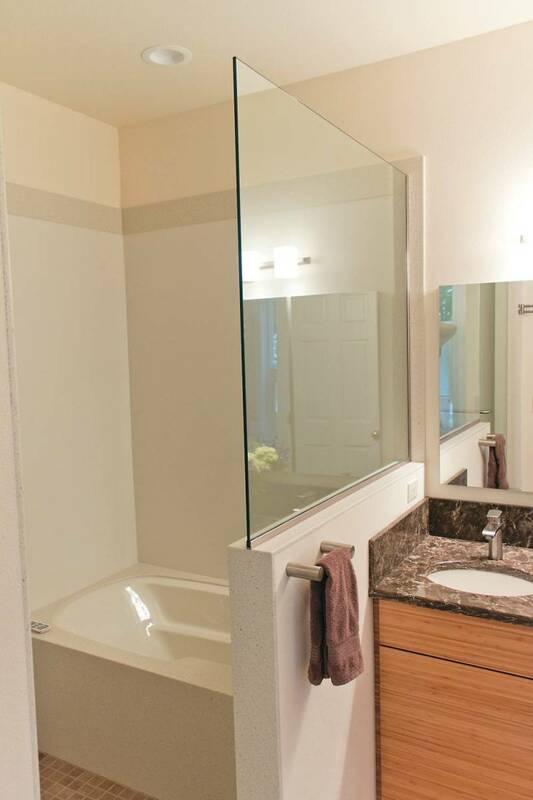 They had to overcome a few shortcuts that the original contractor had taken, but no big surprises that can so often plague home remodeling projects. McCabe took care of the redesign while leaving the surface choices for cabinets and countertops to the homeowners. “I didn’t know what was innovative here in the U.S., so I used the internet to see what was popular,” the homeowner said. “Molly made it fairly painless and easy. Having lived in Japan for so long, the couple adopted some of its cultural norms and aesthetics and wanted to incorporate them into their Port Orchard home. One of the first details McCabe noted was that the flow of the kitchen was all wrong. 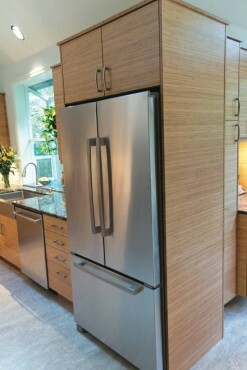 A section of cabinet that housed the refrigerator jutted out at 45 degrees from the floorplan and cut off the dining area from the kitchen. And there was no surface to place hot items coming out of the oven. She moved the refrigerator to the opposite side and took out the odd-angled cabinetry, giving the room an open flow from kitchen to dining. A maple counter space was added next to the oven. The height of the maple was lowered from the rest of the quartz countertops — partly because McCabe often suggests to clients “to have varied heights in the kitchen — it’s ergonomic,” and partly because of her client’s stature. “I’m very short,” the homeowner noted, adding that she appreciated the lower workspace. She had the apron of the sink lowered for the same reason. The couple’s choice for the cabinets was definitely swayed by their time in Japan. They chose bamboo — which was supplied by Teragren on Bainbridge Island, McCabe said — and they stayed with a smooth surface, without the traditional indents and insets. 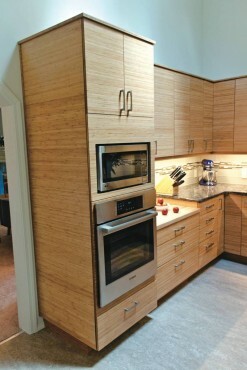 The cabinets feature soft-closing drawers and doors. 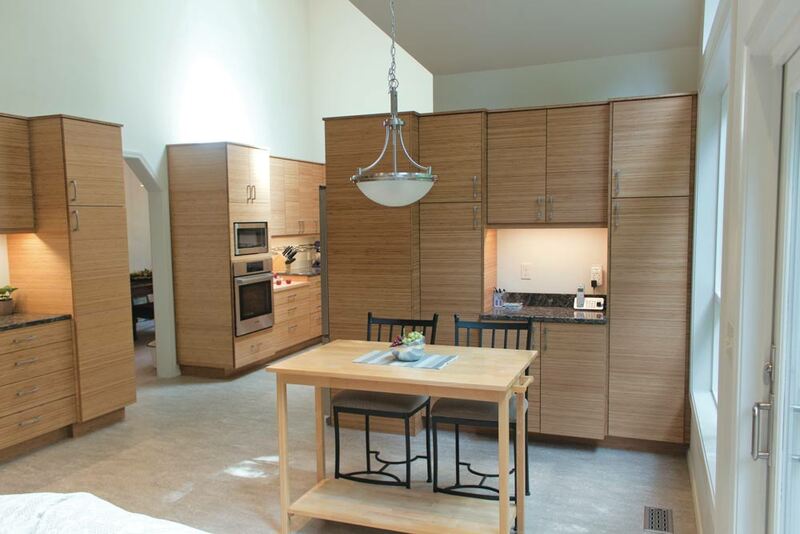 Because of a vaulted ceiling in the kitchen area with a view of the kitchen from a second-floor landing, the cabinetry had to be finished with the bamboo on the top of the cabinets. Having had similar cabinets in Japan, the wife noted that the grain in the bamboo helped “hide” some of the day-to-day dust or dirt that would show up on a traditional cabinet surface, as well as finger smudges and other minor marks. 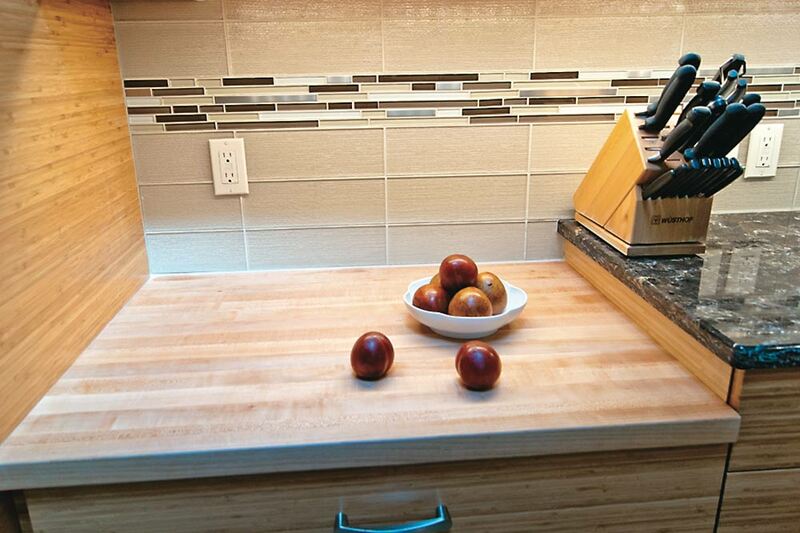 “I like the kitchen to be clean, but I don’t want to spend all day wiping down the cabinets,” she said. The same can be said of the backsplash, which is low-maintenance, although she didn’t realize it until it was installed. The homeowner originally wanted a single pane of glass for the backsplash, but the budget didn’t quite meet that desire, so they settled on a horizontal-tiled, glass backsplash that features stainless insets. Appliances were replaced, but they didn’t want to lose value by replacing the microwave and wanted to include it into the new kitchen design. So McCabe came up with a unique solution: It was added in above the oven, but is a separate compartment with a panel framing the microwave that can be recut when it comes time to replace the unit. 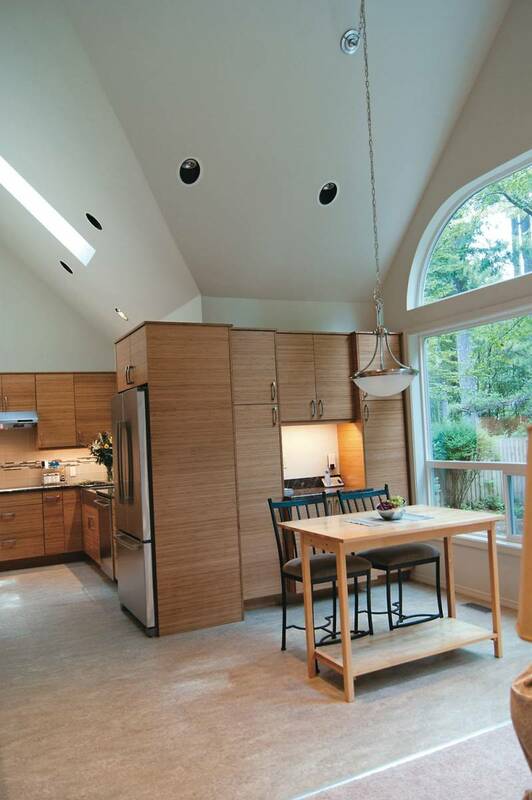 The vaulted ceiling is accented with recessed halogen lighting and includes undercabinet LED lighting. 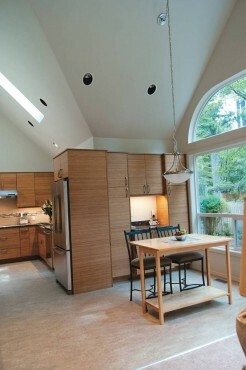 The homeowner said she often uses only the cabinet lighting, as a skylight also provides additional natural light. “We call it our ‘happy light,'” she said. 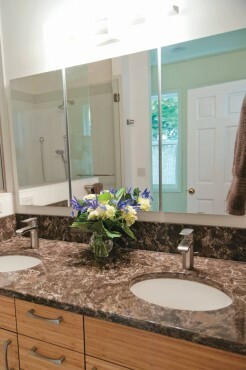 The other room that saw major change was the master bath. The couple wanted to incorporate Japanese features — including a washlet commode and shower and soaking tub traditionally found in Japanese homes. “We have a lot of friends coming from Japan and the biggest complaint is this (the comforts in the bathroom),” the homeowner said. A washlet toilet has features not found in American-style bathrooms. It comes with a control panel mounted on a nearby wall that provides a multitude of extra features, such as a bidet, a seat warmer, and auto lifting and lowering of the seat, among others. An area of the bathroom that presented the biggest challenge to the redesign was the shower and tub. 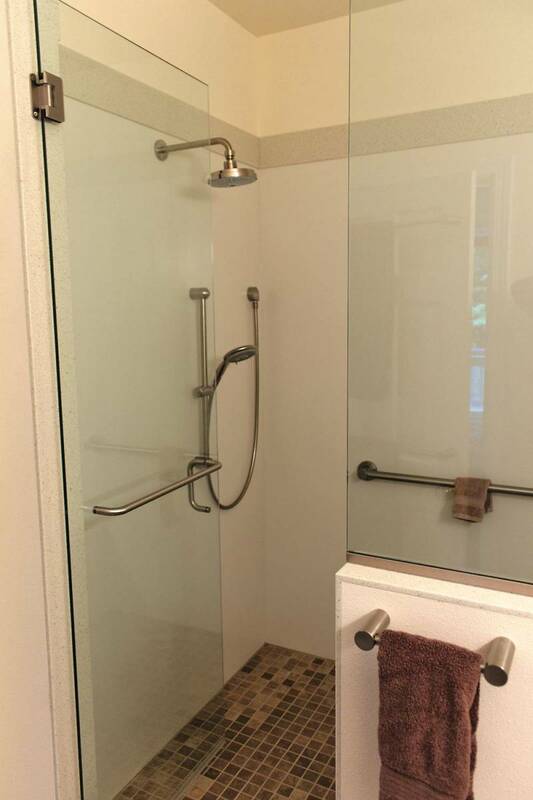 In a traditional Japanese bathroom, there is a shower area to wash off and a soaking tub to climb into after getting clean in the shower, known as a wet room. 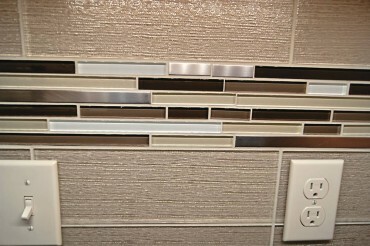 The couple wanted to incorporate this into their new master bath. “You kind of get used to certain things, and you don’t want to go back,” the homeowner said. So a Jacuzzi tub was removed, as was an internal wall. 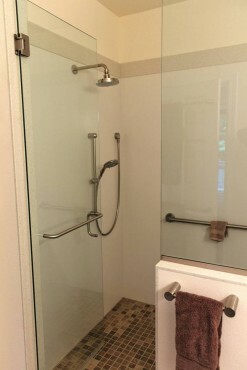 An enclosure was created, featuring an all-glass door and a front wall alongside the door going part way up from the floor and finished off with glass to help give the space an open feeling. Because of the constraints of the room size at 10 by 11 feet, it took some maneuvering to get all this in — plus two sinks. 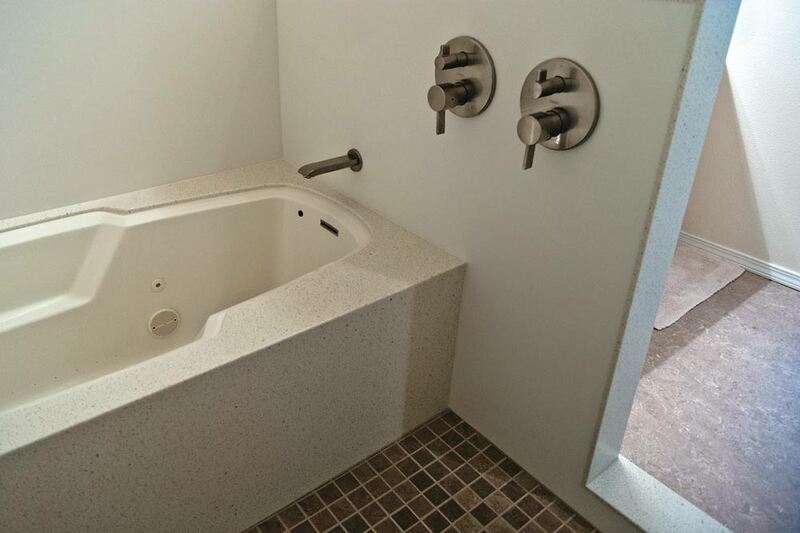 The tub became an issue as the space didn’t allow for a full-sized unit and only one manufacturer had a soaking tub the size they needed. But they are happy with the results, as they have a master bath that reminds them of the comforts they had while living in Japan. The redesign didn’t provide McCabe with any major concerns or issues. McCabe said the fun in the project for her was helping her clients discover their own aesthetic and seeing how their tastes had refined and matured from when they first built the house. “Watching them discover what their options were was like watching a kid at Christmas,” McCabe said. 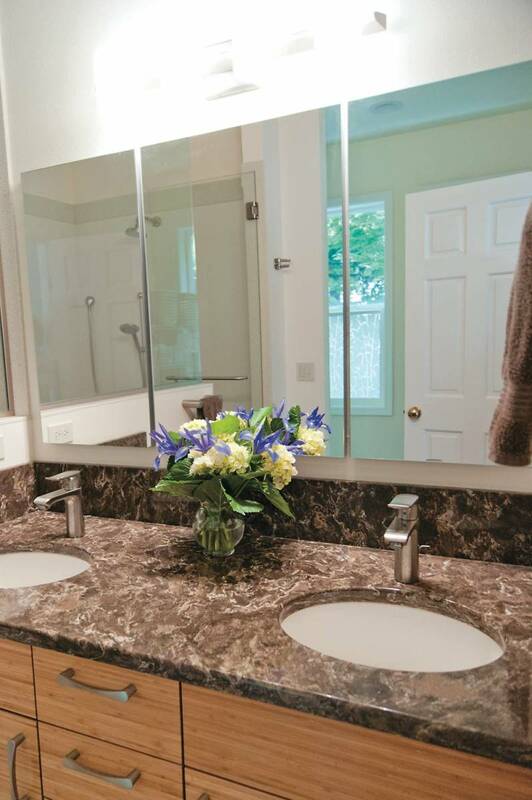 This ability to visualize a space in three dimensions and her taste in room design and ergonomics have served her well in garnering rave reviews from past clients. McCabe credits her husband and co-owner of the business with her success. “I couldn’t do what I do without him,” she said. And what she does is make her clients fall in love with their home — even when they haven’t seen it in 19 years.